Strong as an Ox, nimble as a Panther. 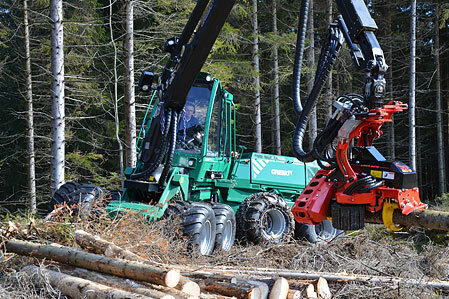 The Gremo 1050H is a reliable harvester ideal for thinning and final cutting. 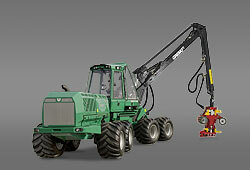 The new engine, strong as an ox, together with the big working pump produces sufficient hydraulic power for any imaginable situation. This means shorter working cycles and yet enough strength for operating in interaction the different functions. In other words: Better performance! But, as you know, strength alone is not all. 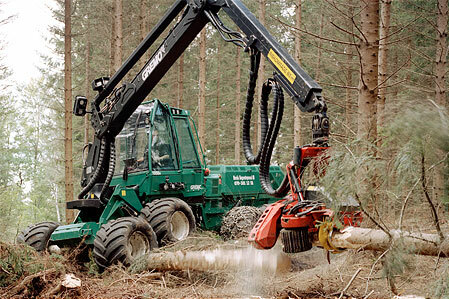 A harvester must also be flexible and safe to meet the requirements of forestry work. Therefore, we keep to our proven design with eight wheels. 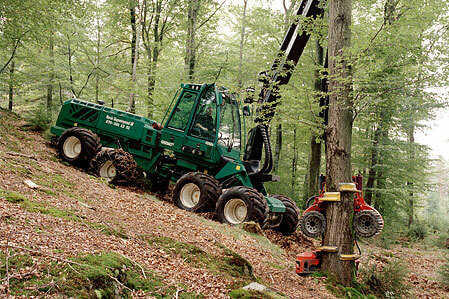 This ensures excellent forward movement and ideal load distribution also on rough and soft ground. (It is even possible to put tracks on all bogies). The automatically actuated bogie locks are one of the secrets behind the outstanding lateral and longitudinal stability of the 1050H. Other assets are the low centre of gravity and the ideal load distribution in longitudinal direction. And owing to the bogielift a considerably smaller turning radius is achieved. Thus, our statement is justified: The 1050H is strong as an ox and nimble as a panther.